Do you read labels? I do. Always. It's a little quirk of mine, but one that repeatedly proves very useful. Getting familiar with ingredients list of your food or medicine can prove truly enlightening. Perhaps it is only to be expected that I also study book covers, in detail. I'm particularly fascinated by one-line excerpts from magazine reviews. I truly admire the ingenuity of their creators. The simple, if cloaked, request (buy the book) inevitably turns into a wordy eulogy. How long can you spin a short message? I would run out of creativity - and patience! - after three raves or so. Magazine writers seem to be able to go on forever. 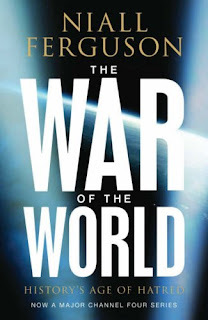 Niall Ferguson is a real darling of the critics, if the cover of The War of the World is to be believed. 'One of the world's 100 most influential people'. 'Niall Ferguson has transformed the intellectual landscape'. 'The most brilliant British historian of his generation...'. Proud claims, wouldn't you agree? The War of the World is pleasant enough. It's engaging, easy to follow, accessible. Yet... I can't see how it is exceptional, much less how it transforms the intellectual landscape. Simply put, the book is just another historical narrative covering the World Wars. I know that Ferguson tried to avoid exactly such judgement, he admits this much in the preface. As I understand, he tried to write an analysis of the twentieth century warfare, focusing on search for some general theory, applicable to all or most of armed conflicts. I acknowledge his effort and applaud the idea, but I also believe he completely failed to achieve his goal in this particular volume. With pretty much whole book devoted to the first and second global conflict and only a few chapters to the second half of the century, proportions are simply not right. Unfortunately, I couldn't detect anything revolutionary or 'landscape transforming'. The narrative is a standard 'World Politics according to a Western historian' story. At one moment I actually wished historians were forbidden to write chronicles of their own country. Moral relativism inevitably surfaces and after a while, irks. But OK, Ferguson is not TOO guilty of this particular charge. I also found some of his information not trustworthy. I wouldn't stake my reputation on that - after all, he's the historian, not me - but at the first sight some of his facts beg for further questioning. So does spelling of Polish names (I was born in Poland, I know). Truth to be told, such obvious mishaps don't surface too often and I admit I'm being picky. The War of the World is definitely readable. Not life-changing, but very, very decent.